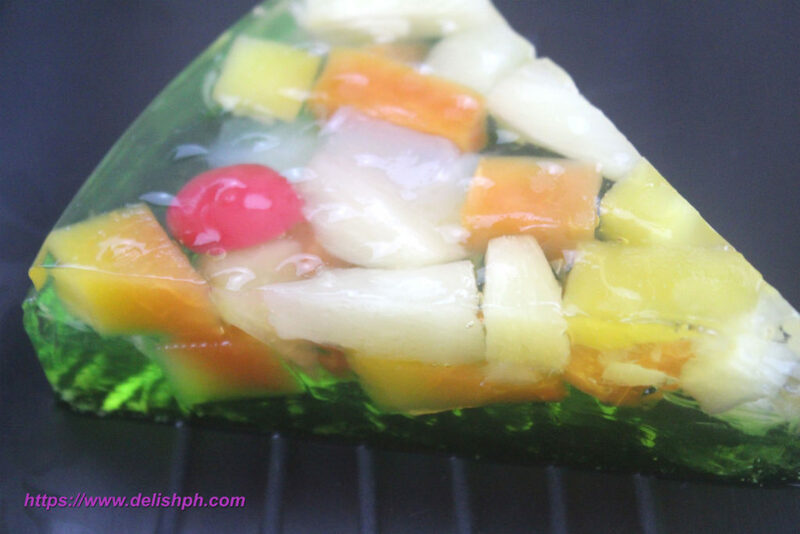 If you wanted to serve something fruity and wiggly dessert at home, you can try this Fruit Cocktail Jelly Cake. It’s absolutely very easy to make, and definitely your kids will love this. You can even add more colors and flavor if you want to. 1. In about 3 cups of water, dissolve the unflavored jelly powder. Once all the powder is dissolved, turn on the heat. Let it boil for about 3-4 minutes while stirring constantly. Remove from stove. 2. Prepare a baking pan (depending on what shape you like). Pour a small amount of jelly mixture on the pan. Enough to cover the bottom part. 3. Scoop a small amount of fruit cocktail first and spread it all over. Make sure to arrange them beautifully. Let it sit for about 5 minutes. Then start adding all the remaining fruits. 4. Pour in the remaining jelly mixture as well. Set aside and let the jelly set. 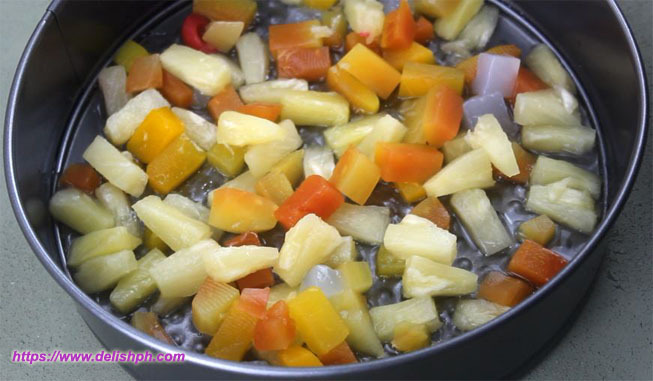 5.Prepare the buko pandan jelly by preparing around 2 cups of water in a pot. Stir to dissolve the powder. Turn the heat on and let it boil for about 3-4 minutes while stirring constantly. Remove from stove. 6. Finally pour in the buko pandan jelly mixture into the pan. Let it cool and refrigerate for about 1 hour before serving. You can add this recipe to your birthday party recipe list. Since this is most likely the kid’s favorite. You can also add other layers of jelly if you want to. If you have any question or suggestion about this recipe, drop a comment below or send me an email or send us a direct message on our Facebook Page.